The day of my fly fishing excursion in Argentina, the forecast was for a high of 85 degrees, one of the great benefits of traveling in the southern hemisphere in December. I met my guide, Lucas Darsie, at 5:30 am. We drove for an hour, through the most perfect, picturesque hills and valleys. With few trees, we saw amazing views in all directions. There was no one around for miles. The sun was coming up above the peaks of the hills. This was the most beau tiful place that I have ever fished. We got out of the car to begin our hike to the stream. I saw a sign at the gate, and even my rudimentary Spanish skills could decipher that we were to fish the San Jose River, a stream protected by the Cordoba Trucha (Trout) Club. Then I asked Lucas the question that I had been practicing all morning to myself: “Donde estan las truchas?” “Where are the trout?” He smiled and pointed to a small path that would require a half-hour hike. As we walked, Lucas told me about the Cordoba Trucha Club that he founded with his friend Esteban. They had created the signs to protect the stream. They came out every week to clean up, and they enforce the catch-and -release policy on the water. Like every fly fishing stream from New York to Montana to Argentina, the San Jose River is precious and fragile. When I learned that Lucas worked to protect his stream, I smiled as I was once again reminded of the connection between fly fishing and the environment. As fly fishers we want our children and grandchildren to have that same wonderful experience of seeing a trout rise to a fly and breathing in the perfect cool air on an early morning fishing trip. As we hiked, there was no one around for miles. The scenery was beyond description. But I soon discovered that we were actually in a minefield. It was not a war zone exactly, but rather a very popular route for cattle. There were huge cow pies everywhere! Argentina is known for its beef, all grass-fed and natural, giving it a superior flavor to our American cows fed on a diet of corn and hormones. The San Jose River wound its way through a large ranch, and we saw a dozen or so cows on our hike. Lucas and I arrived at the river at about 7 am. There was a good hatch of flies, and I cast my Griffith’s Gnat onto the stream. Within half an hour, I caught four small rainbows, all of which were returned to the river. As the sun came up, and the hatch ended, we began to hike down stream. Lucas was carrying my backpack and water bottle and hopping like a mountain goat from rock to rock. I was trying not to fall too far behind or sprain an ankle. We stopped at many fishing holes, and Lucas aptly suggested where to cast and which fly to use. With a brown grasshopper at the end of my line, I tempted a "monster" fish, who moved towards the surface, but then retreated back to the deep water. Later on, I hooked another good size trout, and felt the strong tug on the line and the bend of the rod. I almost had the fish in hand, but I pulled a bit too hard and the line snapped. Video: The Trout that Got Away! After a few hours of beautiful scenery and casting, Lucas and I began the long trek through the minefield and back to the car. I was exhausted, but felt that sense of calm and peace that comes after an exciting adventure has ended. I will not soon forget the views on the San Jose River or the perfect solitude I experienced knowing that Lucas and I were the only hum ans nearby. On my trip to Argentina, I learned that fly fishing is an international language. Lucas and I grew up in different countries, speak different native languages and have different religions. But as we fished for truchas, spoke about our families, and reflected on our passion for preserving rivers and streams, Lucas and I became friends. Fly Fishing knows no international, religious or ethnic boundaries. Through the miracle of the internet, I keep in touch with fly fishers in Israel, the UK, Finland, New Zealand and all 50 states. When fly fishing brings us a greater appreciation of nature, inspires us to protect our world, and forges connections across continents, then it is no longer just a hobby. It is a valuable passion for us and for our planet. To contact Lucas Darsie for a guided fly fishing trip to the San Jose River, Patagonia or to pursue the golden dorado, CLICK HERE. Enjoyed the read Eric, thank you. It's heartening that people can be united in at least one aspect of our lives. So why don't you ever invite me when you go to the good places? A friend took a similar video of me this summer, tied into a huge trout. Fortunately, the sound of the river was loud enough that you cannot hear me yelling at him -- with a few colorful words -- to drop the camera and pick up a net. Sorry not calling you a "rabbi" - Rabbi Yeshua taught us to call Rabbi only to him - but I want to tell you how I was pleased to read your blog because we have many things in common. Actually the language of fly fishing is supra-national. Anywhere in the universe, a fly fisherman will be able to understand others - even here in Acre, Brazil (the Amazon forest). How wonderful that two fly fishermen, who only have in common are Benei Avraham, can understand the other - until we understand what a ger speaks! Ah, my dear you managed to express the essence of fly fishing. Sorry, but forgot to sign. Hello. I live in Argentina. I enjoyed a lot your comments about fly fishing in Cordoba. Its a beautiful place. 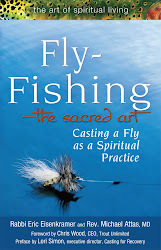 I am delighted about the way you put your spiritual and religious life on trout fishing. Here in Argentina we have a lot of places,in Cordoba and Patagonia to fish and to spend great moments.